Terrorist arrested near Paris in 'advanced stage' of planning attack had been convicted alongside Paris attack ringleader. French officials said Friday they had foiled a terror attack by a suspect who had been convicted in Belgium alongside Abdelhamid Abaaoud, suspected ringleader of November's Islamic State (ISIS) terror attacks in Paris. French national Reda Kriket, 34, was arrested on Thursday in Argenteuil, northwest of Paris, and police uncovered a small quantity of explosives at his home. Interior Minister Bernard Cazeneuve said the arrest "foiled a planned attack in France, which was at an advanced stage." Police sources said the suspect had been found guilty in absentia in Brussels in July last year of being part of a network recruiting jihadists to Syria and sentenced to 10 years in prison. Investigations showed Kriket played an important role in financing the network with money from robberies and stolen goods. Among those who went to Syria through the network were Abaaoud and another Paris attacker, Chakib Akrouh. Abaaoud was among 28 convicted in the Belgian trial and was sentenced to 20 years in absentia. Brussels, which has emerged as a hotspot for radical Islam in Europe, was hit Tuesday by bombings which left 31 dead at the airport and on the city metro. Police in Belgium and Paris are still piecing together the potential links between the November attacks and those in Brussels this week. One of the Paris jihadists, Salah Abdeslam - who was arrested last week in Brussels - has been linked to Brussels suicide bomber brothers Khalid and Ibrahim El Bakraoui. A third bomber still at large, Najim Laachraoui, has been wanted ever since the Paris attacks. 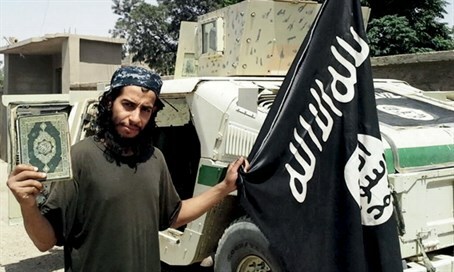 Abaaoud, a 28-year-old Belgian of Moroccan origin, was a notorious jihadist who had appeared in grisly Islamic State group videos and was behind several failed attack plots in Europe. On November 13 he formed part of a 10-man team of gunmen and suicide bombers that left 130 people murdered in a series of attacks on Paris, with authorities referring to him as the "ringleader." Abaaoud was killed five days later in a police raid outside Paris, during which Akrouh blew himself up, also killing Abaaoud's female cousin. Abaaoud and Akrouh were part of the team of jihadists who sprayed Paris restaurants and bars with gunfire on the night of the attacks, murdering 39. Abaaoud was from the Brussels immigrant district of Molenbeek, which has been thrust into the spotlight for its ties to the Paris attackers and Islamic radicalism. It is also where Abdeslam was arrested last week after a four-month manhunt. It remains unclear where Kriket fits in, if at all. Cazeneuve said Kriket had been under surveillance "for several weeks" and that the arrest was also the result of "close and constant cooperation between European services." "He belongs to a terrorist network that sought to strike our country," the interior minister said. Cazeneuve said earlier in March that France has foiled at least six potential attacks since jihadists struck in January 2015, murdering 17 people at the Charlie Hebdo satirical magazine and a Jewish supermarket. Since the beginning of 2016, 75 people have been arrested in France "with links to terrorist activities," 37 have been charged and 28 jailed, he said.